Call the deck coating and waterproofing experts at Tuff Kote Systems today. 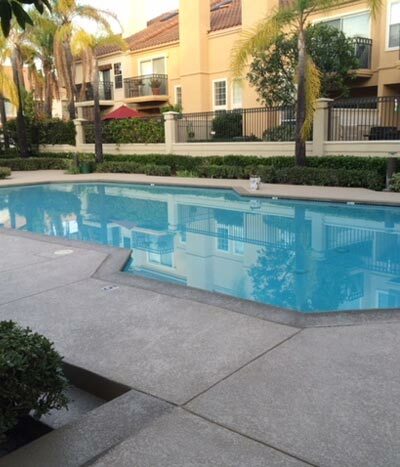 We provide our exceptional quality coating and waterproofing services to Brea as well as all of Orange County and the greater Los Angeles region, and provide estimates throughout our service area. Our business hours are Monday through Friday, from 8:00 am to 4:00 pm, and we accept Mastercard, Visa, American Express, and checks. Tuff Kote Systems is licensed, bonded, and insured. 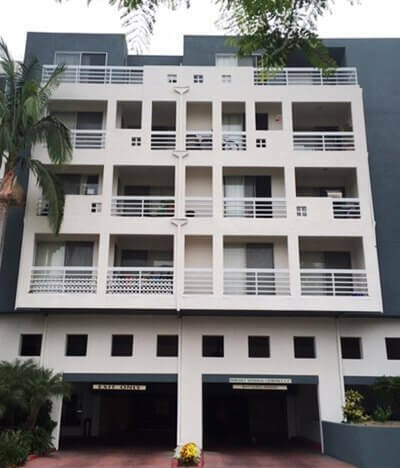 At Tuff Kote Systems, we offer an extensive selection of beautiful and functional deck coating systems to Brea, and we can give your home or business's deck, balcony, or elevated walkway a whole new look. Our deck coating systems are available in an extensive array of colors, textures, and patterns, and are an ideal way to revitalize the look of weathered, worn, or damaged wood or concrete deck surfaces. Our durable deck coatings are slip resistant and ADA (Americans with Disabilities Act) compliant, and are offered with excellent warranties. Rely upon Tuff Kote Systems to resolve above grade and below grade moisture problems in your Brea home or business, and to do so for a very competitive price. Water leakage through roofing systems, and decks and balconies located over living areas can cause significant damage to the interiors of their associated structures. Once water gains access to a home's interior through damaged areas of the roof, at points of improperly flashed roof penetrations, or through damaged deck or balcony coatings, water damage to drywall, woodwork, flooring, and other interior surfaces can result, causing the need for expensive home repairs. And below grade structural components can be seriously damaged by exposure to ground and surface water, which can cause concrete spalling, reinforcing steel corrosion, and the formation of cracks in the home due to the effects of structural settlement. But this is only the beginning of problems excessive moisture can cause. Whether it comes into the home from above through the roof or a deck, or seeps up from below, this excessive moisture can encourage the growth of mold and mildew within the home's envelope, causing serious structural damage and adversely affecting the health of the home's occupants. 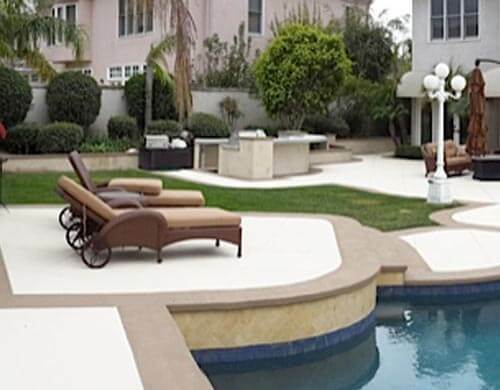 Depend upon Tuff Kote Systems for comprehensive deck repair and restoration services in Brea. At Tuff Kote, we can make your worn, weathered, or damaged deck look good as new. We offer comprehensive deck cleaning, maintenance, and restoration services, for both residential and commercial decks, balconies, and elevated walkways. We can repair and replace damaged deck members, repair cracks, and replace damaged deck sheathing. We perform deck framework repair and replacement, and can correct deck drainage issues. We can install flashing where it is inadequate, and replace old, damaged flashing. And when these surfaces are located over living spaces and have suffered water damage, we can perform roof and ceiling repair as needed. In addition, after we are finished with our repairs, we will perform stucco patching and painting, and replace damaged wood siding as necessary. 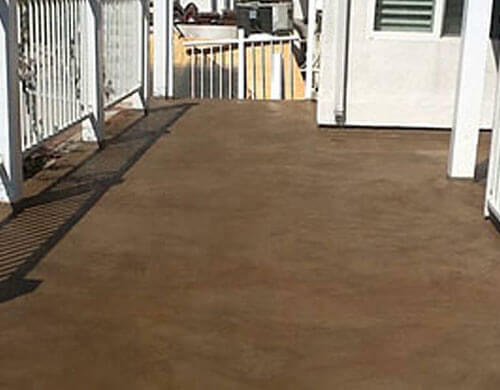 Tuff Kote Systems provides affordable concrete staining services to Brea homes and businesses. Staining is the ideal way to beautify such concrete surfaces such as patios, walkways, driveways, interior floors, and pool decks. 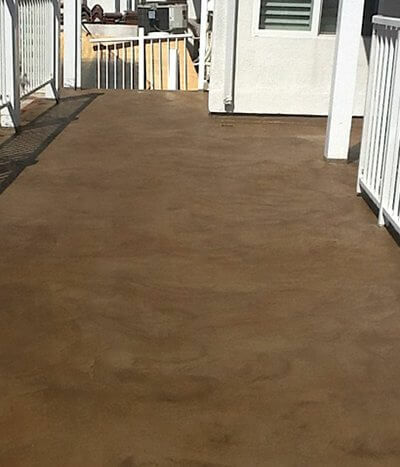 It can be performed for both residential and commercial applications, and on both new and older concrete surfaces. At Tuff Kote Systems, we offer a wide selection of color and pattern choices, which can be utilized to create a limitless array of design possibilities. We use only top quality stains and dyes to perform our work, and our creativity of design and excellence of craftsmanship is unmatched in the field. Moreover, we offer the best value around in terms of competitive pricing. Call us today. At Tuff Kote Systems, we possess the knowledge and expertise required to install the most innovative Title 24 compliant roof coatings available today. Over the years, we have provided our energy-saving, Title 24 compliant roof coatings for countless numbers of commercial and industrial clients, and have a well-established reputation for excellence of craftsmanship, competitive pricing, and exceptional customer service throughout our service area. 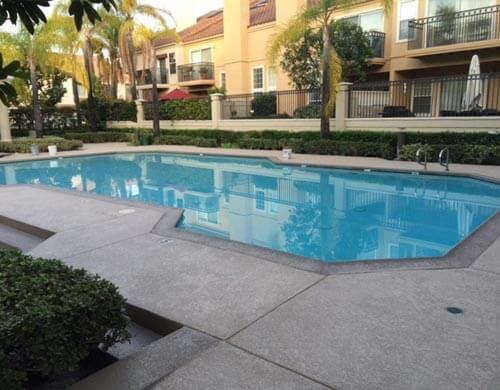 Call us today in Brea. At Tuff Kote Systems, our decorative finishes are available to Brea home and business owners in an endless array of colors, designs, and textures, only limited by our imaginations and those of our valued clients. Our popular smooth decorative finishes can be installed in an extensive selection of colors, and we also install textured finish designs such as knockdown and orange peel. We can use overlay templates to create the latest "faux" stone, brick, and tile designs, including cobblestone, flagstone, slate, granite, marble, herringbone-pattern tile, and Spanish tile paver looks. 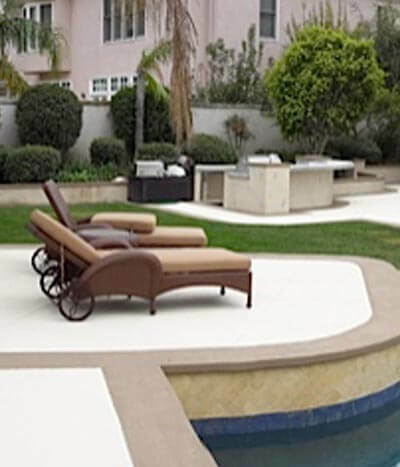 But our decorative finishes are not just beautiful, they also provide safety: They possess a Class A fire rating, and are slip resistant – an important feature for pool decks and flooring, and will help protect your family, employees, patrons, and guests against injury from slips and falls. In addition, our decorative finishes are also heat resistant, and will remain comfortable to the touch on hot, sunny days. Contact the professionals at Tuff Kote Systems. We offer estimates to Brea and all of our Orange County and Los Angeles region service area, and are licensed, bonded, and insured. 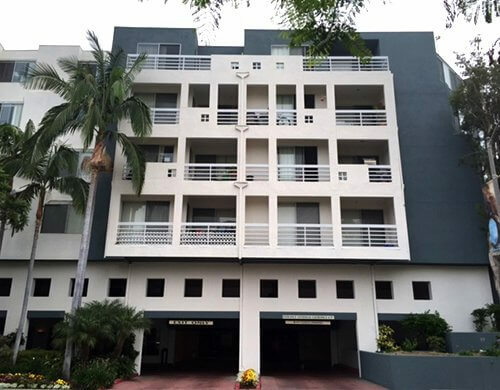 We stand behind our premium quality deck coating and waterproofing systems with excellent warranties, and are committed to providing our residential and commercial clients with excellent customer service. Call us today.